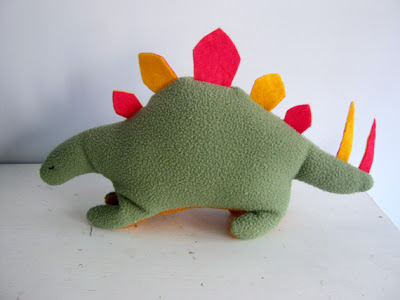 You were warned about the Dog, but the Stegosaurus is here too! My girls love dogs. And dinosaurs. Did you know there are 13 Land Before Time movies? And yes, we've seen them all. Although, I may have slept through a couple. I fully expect J to open this Stegosaurus at Christmas and immediately say, "Now I need a Long Neck, a Cera, a Ducky, and a Flier!" And L will ask for several more dogs in a variety of shapes and colors. Yes, I'm prepared. But for now, one pattern at a time. Or, ahem, two. 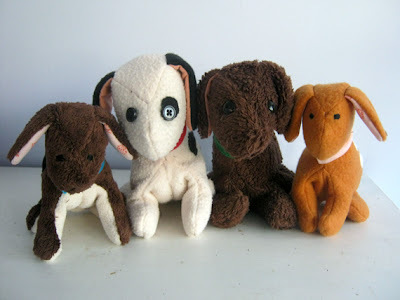 I don't expect these to replace Pink Dog, but I'm hoping they'll join the pack. 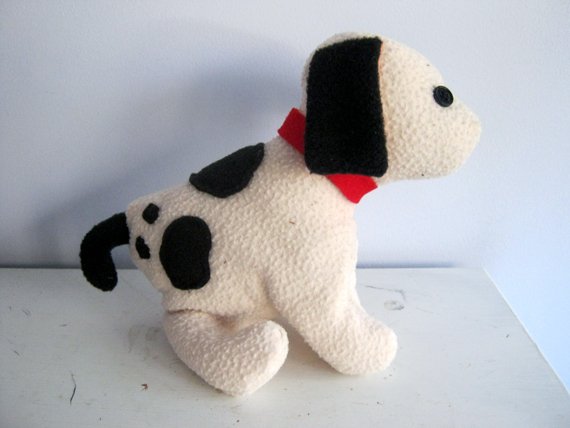 My goal was to make the cuddly, so you may notice a few differences. 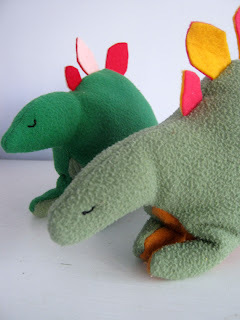 They're made of fleece and furry blankets, and they're half filled with poly beads to make them more flexible - so they don't stand up perfectly for photos. I made the dogs in two sizes, just enlarge the pattern a bit more because - of course - we need a mommy dog and a baby dog. 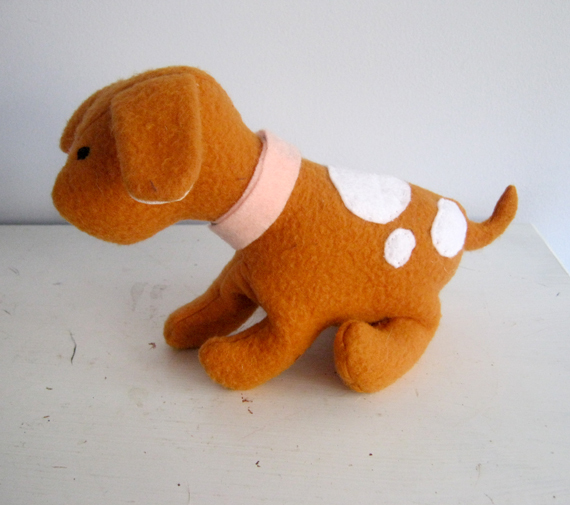 Also the dogs have a million variations - button/embroidery eyes, various ears, tail up or down, spots - ooh, and an easy, no sew collar. Here's a qick giveaway: Today until the 16th - click the links below to grab these patterns and make some last minute Christmas gifts! I've changed file hosts, so I'm hoping not to have bandwidth issues. (fingers crossed) (Updated: Dec. 17th - the giveaway has now ended. Thanks for all your enthusiasm!) After the 16th, you can still find the patterns in shop. Those are SO cute! Sadly, I do not need anymore projects brewing, but I may need some in the future! Thanks for the patterns! They are adorable and I can't wait to try them! thank you so much!!! I'm sure my little guy will love them. Thank you! Both are adorable. thank you for the patterns, i will do it !! Thank you so much for the patterns, they are so cute!! Hope you and your family have an wonderful holliday season!! Thanks for the patterns. I don't know if I'll make it for this Christmas, but I am looking forward to trying these. Wow! I had no idea there were so many of those movies. 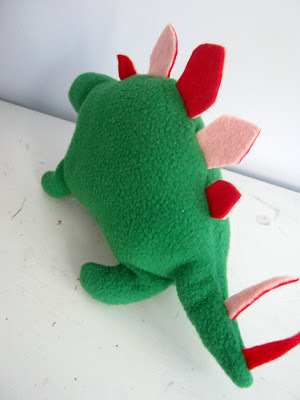 They must make one a year like Woody Allen or something because I remember the first one coming out when I was a kid I think... Anywho, I adore that little stego plush!